Rising evidence of a global growth slowdown, trade fears, and the resulting the risk aversion is likely helping Gold report gains. The yellow metal's prices rose to a six-month high of $1.251, having closed higher by 2.1% last week. The rising odds of the Fed's rate pause in 2019 and inverted US yield curve are triggering recession fears which were caused by Friday's NFP report which printed weaker than expected. Notably, the US-China trade war may escalate and the global outlook may further worsen in 2019 if the 90-day truce fails to produce a breakthrough deal. As expected, Gold prices finally rallied and broke above the $1247.5 level and managed to settle above it. 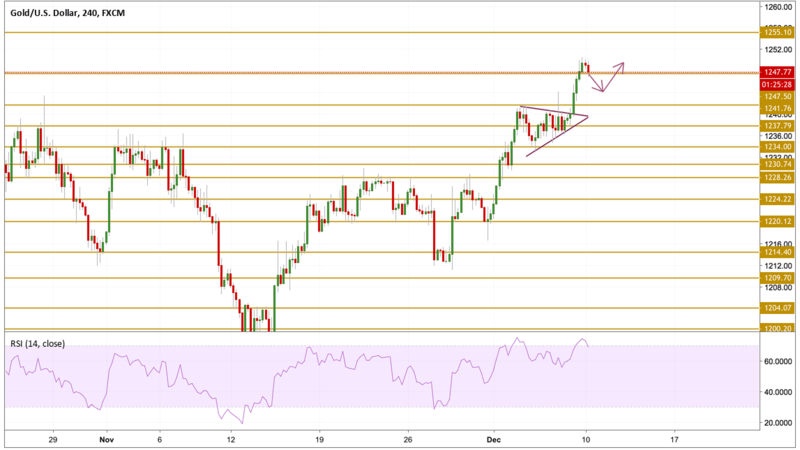 The price is currently receiving support from the $1247.5 level, but a small recovery in prices may be needed to ease the overbought state signaled by the RSI in order to continue the upward move. Today we will be focusing on a consolidation formation above the near support levels.